Multilotto is a company that saw the day in 2011, and they’re primarily a lottery concierge service. In fact, they specialise in giving you access to the biggest lottery jackpots in the world such as Powerball and Mega Millions. Which means that because of them, you can play American, European, Australian and Canadian lottery from anywhere in the world! What’s more is that thanks to their website you’ll have the chance to playgroup lottery too! So, you can have a stake in hundreds of lotteries for just a few quid and more chances to win big! But that’s not all! Indeed, they also understand the importance of diversifying the offers they make to the players. And for this reason, they also have a state of the art casino! 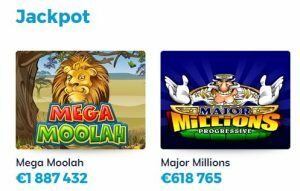 So, you’ll have the chance to play some of the biggest progressive jackpot slots online such as Mega Moolah and Major Million. General Concept: Play the biggest online and offline jackpots! Game providers: QuickSpin, NetEnt, Microgaming, RedRake, Authentic Gaming, Pragmatic Play, Play’n Go, Yggdrasil and Playson. Special features: App available on Apple App store and Android App Store, lotto statistics and lotto results. Customer care availability: email only. Payment methods accepted: Diners Club International, JCB, MasterCard, Visa, Entropay, Zimpler, Neteller, Skrill, Paysafecard, Trustly, and ePro. There’s nothing like claiming a good deal if you’re an online casino player! And without a doubt, this is one welcome bonus you won’t want to miss! Indeed, if you decide to deposit on Multilotto know that they’ll match-up your first deposit! Which means if you deposit £100 you’ll play with £200 and have double the chances of winning big! But as always, they’re a few conditions to respect. In fact, both the Free Spins and the deposit bonus are subject to wagering requirements. By claiming the offer, you agree to wager the deposit and the bonus 35 times before withdrawing. Also, know that the maximum amount withdrawable from the Free Spins is £100. To claim the welcome offer, you’ll need to make a minimum deposit of £10. Plus, according to their t’s and C’s you can use any payment method to claim the deal! Multilotto holds two very well-respected online gaming licenses. Indeed, one from the UKGC which means it’s legal and safe for you to play there. And another one from the Maltese gaming authority, which means Multilotto is a serious operator and they’ve passed all the necessary check, twice in fact, to get these licenses. So, you’re in great hands if you decide to play there. Also, you might be interested to know that a young couple from West Yorkshire won £1,000,000 on UK Lotto draw on July 11th 2018 when using their website and getting lucky in the Millionaire Raffle! A great thing about playing there is that you can use your winning from lotteries to play online casino. And what’s more exciting to know that you can join lottery groups (or syndicate) to have more chances of winning a life-changing amount! All and all, Multilotto website is very well designed, and it’s easy to navigate! The focus is primarily on lotteries. So, to access the casino product, you’ll need to click on the pink play casino button located in the top navigation menu. Also, know that they have an extensive FAQ section, so help is only one click away if you ever have any questions. Hunt down the biggest online jackpot today and claim the welcome bonus to have more fun doing that!